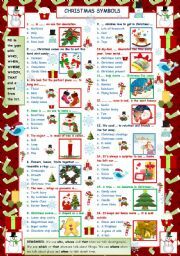 Quiz to review Christmas vocabulary and relative pronouns. 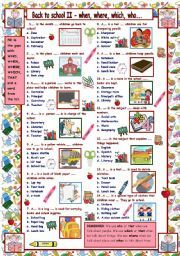 Easier version for beginners http://www.eslprintables.com/printable.asp?id=483192#thetop Hope it´s useful. Have a great day!!! 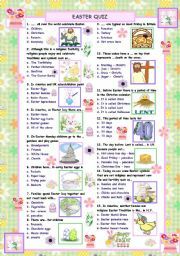 Easy quiz on Easter - answer key included - Hope it´s useful.Have a nice day! 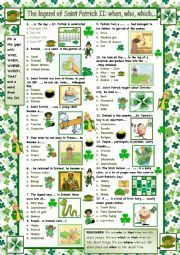 Quiz to review on Saint Patrick´s Day and relative pronouns. Hope it´s useful. Quiz to review Thanksgiving vocabulary and relative pronouns. 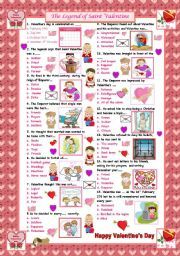 Easier version for beginners http://www.eslprintables.com/printable.asp?id=479220#thetop . Hope it´s useful. 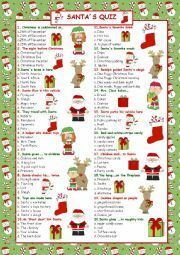 Easy quiz about Santa... Hope it´s useful! 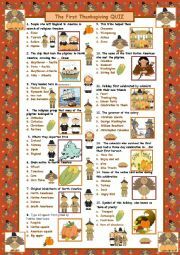 Easy quiz on The First Thanksgiving - answer key included - Hope it´s useful.Have a nice day! Basic reading - comprehension worksheet about the origins of this tradition we know as "Halloween". Page 2 has some activities: questions, riddles and fun facts. I´ve done for my 5th graders. Hope it´s useful for you too! Easy Thanksgiving Quiz for beginners. Hope it´s useful. Happy Thanksgiving Day.